Fragrant vegetable stews are common around the Mediterranean. This streamlined version is flavored with a North African spice blend and simplified with the use of precut, frozen bell peppers and onions. Heat oil in a large nonstick skillet over medium-high heat. Add pepper and onion mix; cook, stirring occasionally, until most of the liquid has evaporated, 3 to 5 minutes. Meanwhile, coarsely grind coriander seeds, caraway seeds and salt in a spice grinder, dry blender or mortar and pestle. Transfer to a small bowl and stir in paprika and cayenne. Add garlic and the spice mixture to the skillet; cook, stirring, for 30 seconds. Add tomatoes and chickpeas; bring to a simmer. 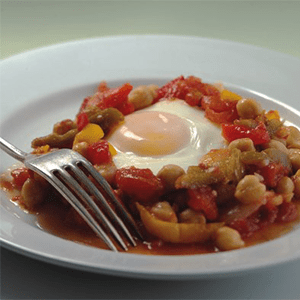 Reduce heat to medium and cook at a lively simmer until slightly thickened, 8 to 12 minutes. Season with pepper. Break eggs into separate halves of the pan, taking care not to break the yolks. Reduce heat to medium-low, cover and cook until the eggs are set, 5 to 7 minutes. Sprinkle the eggs with paprika.